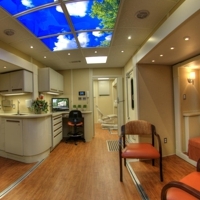 Inside and out, LifeLine mobile medical units are commercial-grade, not residential-grade. Mouse over the numbers on this photo to read why LifeLine Mobile is your first choice for a world-class mobile unit. 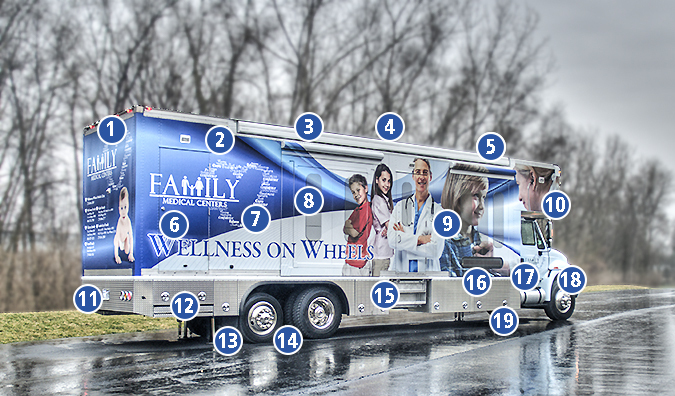 Click for a FREE copy of our new, updated mobile unit Planning Guide! A clinic understructure composed of 4 inch steel I-beam cross members are under the full length of the undercarriage. 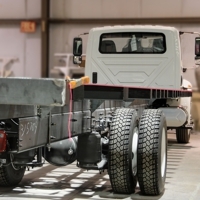 No wonder our first mobile unit is still on the road after 25 years! Our ceiling height is taller than others. On most models our interior storage loft is a huge indoor storage space. Overall, we give you 32.9 percent more! Others use cheap box store furnishings which look great for a year or two but never last. 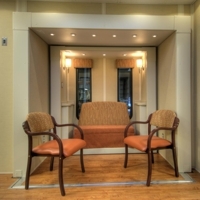 We always use premium, commercial-grade furnishings, doors, flooring, and walls. Get the look and feel of a real office. 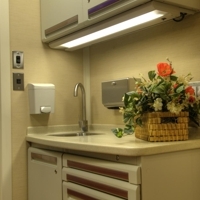 We never use a warmed-over RV chassis as the building block of your new mobile unit. So we have patient confidentiality, disabled persons' access, and sanitation in mind.